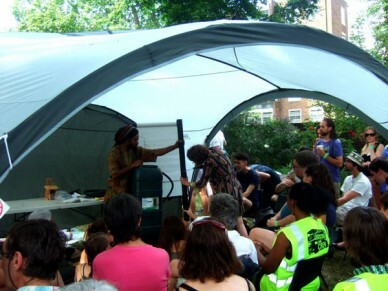 Sunday 14th July saw Cecil Sharp House as the venue for the 4th London Permaculture Festival in Camden. Regular Pocket Farm contributors and permaculture practitioners Iain and Wenderlynn Bagnall braved a sweltering public transport system to pay their first visit to the event and this is their verdict on proceedings. 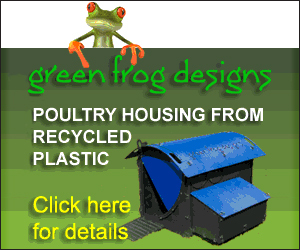 Permaculture is notoriously difficult to define and this has been the subject of a fascinating debate recently. But this event was held by London Permaculture so let us go with its definition for now: “a collaborative (wiki-style) project in which people around the world collectively design solutions to the problems of building a sustainable future… Permaculture’s strength lies in its strong ethical foundations- Earth Care, People care, Fair Shares”. This strong ethical framework was in evidence at the festival, with people being very open and friendly. At one workshop, for example, a dish of freshly-picked cherries and redcurrants was passed around for everyone to share. Although this was our first visit to the festival, it was the fourth year that it has run, and is one of the largest permaculture events in the country, so we were looking forward to a day of workshops, talks, music and storytelling. After a roasting hot journey involving the dreaded “replacement bus service” we finally arrived at Cecil Sharp House, home of the English Folkdance and Song Society. We paid our very reasonable £5 entry fee and made our way into the busy main hall. Wenderlynn has only just completed her Permaculture Design Certificate (PDC), led by Aranya and was keen to attend his workshop on systems and patterns. We had half an hour before this began, so we went to his stall for a chat first, which was a great start after having heard so much about him. 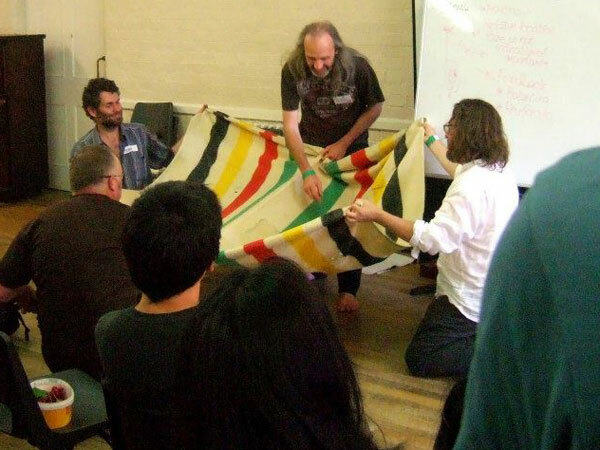 The workshop was fantastic and really helped me understand some very abstract principles about natural pattern languages that I had previously struggled a little to get my head around, even having read his excellent book, Permaculture Design – A step-by-step guide. Wenderlynn had told me what a great teacher Aranya was and in a little over an hour, I could see why. I don’t know if anyone videoed the session, but here is a similar workshop from 2010. Next up was Alison Ensor’s presentation of her Applied Permaculture Diploma. Wenderlynn is just starting out on her diploma, an intensive journey which requires ten projects to be completed covering a broad range of expertise. The diploma requires you to show that you have been able to apply the skills and knowledge gained on your PDC in the ‘real world’. Alison’s diploma took 5 years and her excellent presentation showed a great depth of knowledge and a real growth in her own abilities and confidence. We spoke with Alison in quite some detail about her diploma and Wenderlynn came away with renewed confidence and a great deal of enthusiasm to get out there and start designing. You can view Alison’s diploma portfolio here. After some lunch (a selection of vegetarian meals were available for around £5), we wandered around the stalls in the main hall, had some delicious cake and spoke to the lovely people from www.seedball.co.uk. We thought that their little seedball tins were a great gift idea, especially if, like us, you aim to buy low-impact, sustainable presents for people. Over at the Permanent Publications stall, we bought a couple more books to add to our heaving bookshelves and had lengthy discussion with the wonderful Maddy Harland about permaculture podcasting, and women in permaculture. For the last workshop of the day, we went outside to the Dome Garden, for Randy Mayer’s talk on setting up a rainwater collection system. This is something we are looking to set up over the next few months on our land, so we were eager to see what we could learn. Unfortunately, the workshop was aimed more at the beginners’ level, so we felt our time was better spent elsewhere but it was great to see the event was catering for both newcomers to seasoned, experienced permaculturists. The festival was brought to a close with a lively set by the brilliant Formidable Vegetable Sound System. 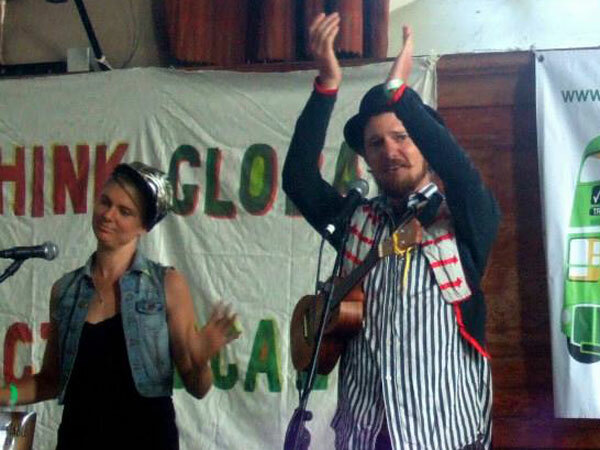 This Australian electro-swing band sing songs based around permaculture principles, combining “radish beets” with sharply-observed lyrics and permaculture in-jokes. Here they are “mashing together speakeasy electroswing-style wonk and live ukulele quirk”. The Formidable Vegetables were heading off to Primrose Hill to continue the party in the evening sunshine, but we had to get back to check on the allotments and our friends’ chickens, so we sadly had to give that a miss. With so much going on, we were only able to attend a small fraction of all the sessions at the festival and missed out on a lot. There were a lot of stalls that we skimmed past, unfortunately unable to stop and talk to everyone and I was particularly disappointed to miss out on Hugh Lupton and Robin Grey’s “I’ll be good to the land”, a history of English radicals’ struggles for land rights in storytelling and song. Overall, it was a thoroughly enjoyable and informative day, although I would like to have seen some indication of suggested experience level for the workshops. The patterns workshop we attended was very advanced and may have gone straight over beginners’ heads, whilst, as mentioned earlier, the water catchment workshop was too basic for us and in hindsight, we would have gone to a different talk, perhaps Andy Goldring’s ‘Starting a Permaculture Revolution’. This is a very minor point however, and we would thoroughly recommend you keep an eye on the website for details of the 2014 festival, which we are sure will be even better than this year’s.